Respiratory distress syndrome (RDS) in newborn babies is caused by insufficient surfactant in their lungs. Their alveoli (small air sacs in the lungs) collapse, resulting in decreased gas exchange and subsequent hypoxemia (not enough oxygen in the blood). Infants with respiratory distress make a grunting sound, breathe rapidly, and retract their muscles trying to inhale and get oxygen. RDS generally begins immediately after birth and results in nearly 100% mortality if left untreated. The primary cause of these premature deaths is organ failure due to respiratory distress, where the baby is not able to get enough oxygen. Quality and contextually-appropriate Continuous Positive Airway Pressure (CPAP) devices can effectively treat almost all of these babies who would otherwise perish. CPAP and other advanced therapies have revolutionized treatment in high-income regions, but India, for example, lags. Addressing RDS supports the UN’s Sustainable Development. 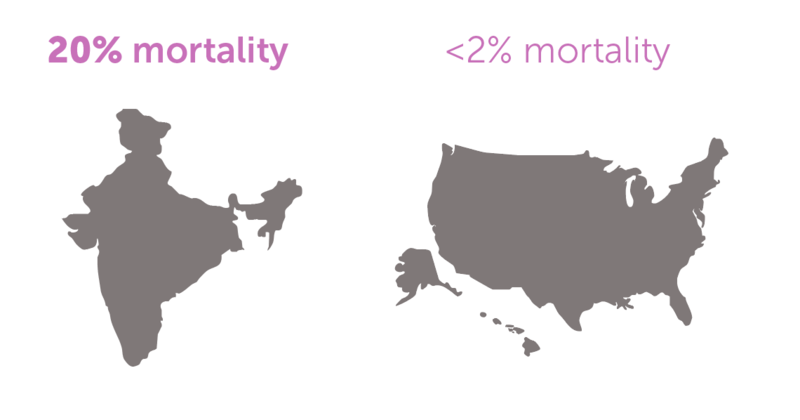 GOAL 3.2: To reduce neonatal mortality to 12 per 1000 live births. Pure oxygen is becoming more widely available across the world in referral hospitals, and doctors use it for mild cases of RDS. Pure oxygen alone, however, is not appropriate for moderate cases, and can result in 75% mortality rate for babies with RDS. Ventilation can be used to treat serious RDS in high-level referral facilities, but is avoided because of serious long-term side effects such as lung damage. Type of respiratory treatment by hospital level. As part of our fieldwork, we observed doctors and nurses fashion “homemade” devices. These homemade CPAP devices are risky—and in many cases can cause oxygen poisoning or blindness. Below are two examples of homemade bubble CPAPs from our fieldwork: on the left a drainage bag, and on the right a water bottle. To close the quality healthcare gap globally, every baby should have access to safe, effective CPAP to treat respiratory distress. At D-Rev, we believe every baby should have the chance to survive and thrive. 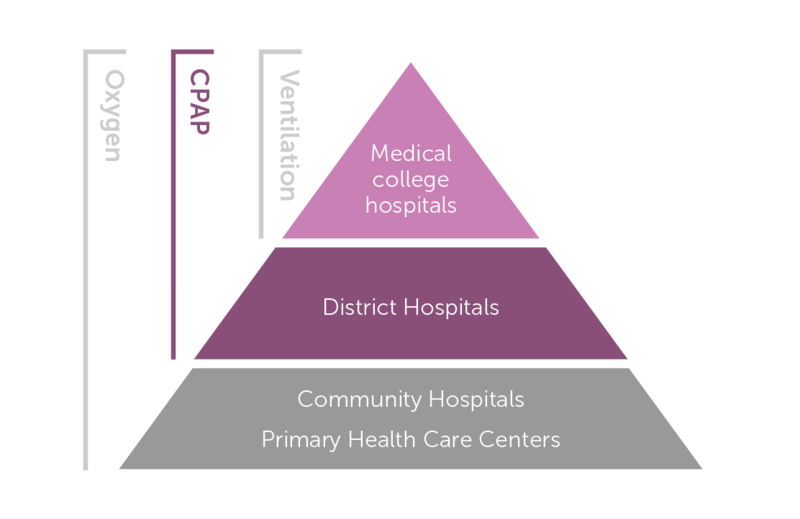 In developing a game-changing CPAP device, we are designing for needs not just of the patients, but of healthcare practitioners, the hospitals, and their context. In high-resource hospitals, the nurse-to-baby ratio is typically 1:1 or 1:2. Most low-resource facilities, however suffer from chronic nursing shortages, and this ratio can be as high as 1:10 or 1:12. Western-designed CPAP devices require constant attention from nurses, making them a poor match to the reality in most of the world’s hospitals. Without user-centric CPAP, lives will continue to be lost. D-Rev is designing a next generation CPAP device that leverages advances in medical research and sensor technology to provide superior respiratory support while lessening the burden on already thinly-stretched NICU nursing staff. Our goal is to end newborn deaths from respiratory distress syndrome. We will improve the delivery of respiratory support to newborns, and enable referral hospitals to effectively manage babies with moderate RDS. In doing so, centralized speciality care hospitals will also have greater space and capacity to treat the babies who are the sickest. While D-Rev designs for global scaling, our initial geographic focus is India and East Africa. We want to create a world where hardworking clinicians have the responsive technology they need to save lives. In recognizing and designing for every day challenges of NICUs, we will end the impossible dilemmas several nurses have reported to us that they face every day: deciding to care for one baby at the cost of ignoring another. 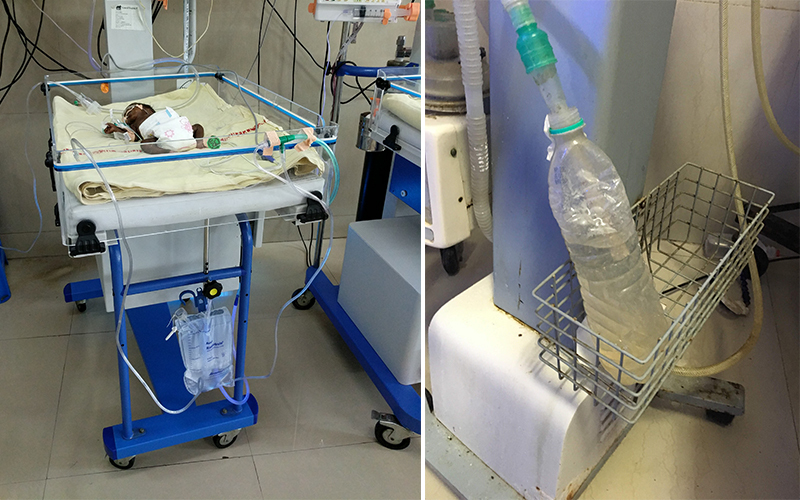 Investing in respiratory support for newborns is cost effective and saves lives. D-Rev’s calculates the system cost effectiveness of smart CPAP to be < $10 per DALY averted, and an estimated cost to donors of $8 per life saved. If this is an area you are working in or have an interest in newborn respiratory issues, please contact us at respiratory@d-rev.org. We are interested in hearing from you.